On the average piece of paper, there are probably a thousand beautiful pieces of art, says Charles Kazilek, the self-named "Pied Piper of Paper." "If you multiply that by the amount of paper that's produced there's literally this Carl Sagan billions and billions of beautiful images and areas every day we just don't know about," Kazilek said. That's the idea behind the Paper Discovery Center's exhibit, "Fiberscapes: Experiencing Paper in 3-D," which has extended its popular run through May 31. The sensory exhibit allows visitors to literally climb inside the fibers in a sheet of paper. Kazilek is the director of technology integration and outreach at Arizona State University in Tempe. Kazilek, whose father grew up in Green Bay, is also technical director of the William M. Keck Bioimaging Laboratory, where the confocal images were produced. The scientific work is enhanced by Kazilek's background in painting and photography. "Fiberscapes" chronicles handmade and mold-made paper images produced by a scanning confocal microscope, which brings the paper experience to life. The resulting compositions show how the fibers are interlaced within a specific paper but also provide interest as works of art. Confocal microscopy produces blur-free images of thick specimens at various depths. Images are taken point-by-point and reconstructed with a computer, rather than projected through an eyepiece. 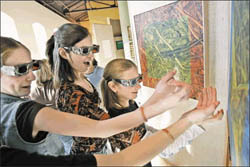 Wearing 3-D glasses, participants walk into the immersion installation where projected 3-D images surround them on the walls, floor and ceiling. Silhouettes of dancers eerily add to the experience. An additional component of "Fiberscapes" includes 10 3-D canvas prints and 10 prints with inset handmade paper. The images are paper fibers magnified thousands of times. Rather than using wood fiber, these papers have been created using silk, cattails, yucca, cornhusks and barrel cactus. "We were looking for something that would be a unique look at paper," PDC curator and archivist Carrie Mahlik said. "To look inside paper is something most people don't get to do." "We consider this a convergence of science, technology and art and it all involves paper," educator Dave Lee said. Also heavily involved in developing the project were Gene Valentine, professor emeritus of English at Arizona State and Jennifer Tsukayama, founder of tsukayama dance collaborative, which integrates dance and new media to site specific works. "The beginning of this was all steeped in a simple science question," Kazilek said. "My colleague and collaborator Gene Valentine came to me one day in 1998 and said, 'I am making paper out of silk and wonder if you'd take a look at it.'" Admittedly not expecting much, Kazilek put the paper under a confocal microscope and was wowed. "I was overwhelmed," he said. "I took some pictures, printed them out and ran across campus to Gene's office and said, 'We've got to do something. This is just too cool to let this go by.' That was just the beginning. That simple question has embarked us on a journey that continues and grows even today." "I just never think of paper," the 12-year-old truthfully said. .
Once Andy experienced the "Fiberscapes" exhibit, his tune changed. "They are cool because you don't get to see 3-D things." "It's awesome," echoed Katie Price, 11. Instructor Matt Braun also welcomed the chance for a first-time visit to the center, which he lives just blocks from. "I've known this was here and always wanted to see it," Braun said. The response to the exhibit has been amazing. To date, nearly 1,200 students have enjoyed the tour as well as adults, families and retired groups. "It's been really tremendous," PDC executive director Val Wylie said. "We are seeing a lot of repeat visitors. The other day we had a visitor with two young children who walked into 'Fiberscapes' and were in there for almost two hours. They just couldn't believe they were inside the fibers of a sheet of paper. It just gives a different perspective of what we've had before." Who'd have thought paper could be so fun? Cheryl Sherry can be reached at 920-993-1000, ext. 249, or csherry@postcrescent.com. Copyright Gannett Company - Reprinted with permission.